When it comes to helping your little one learn the ways of this world – at least from the academic point of view, there are many different methods as well as routes that one is able to take. However, since we live in an extremely technologically sophisticated environment, it might be prudent to go with the times – and this is where the $99.95 Illuminated Learning Blocks come in handy. These happen to be award winning learning blocks, where they will actually boast of the ability to light up as well as teach toddlers about shapes and colors, while being relevant to the older children as well when it comes to the likes of reading, writing, and arithmetic. 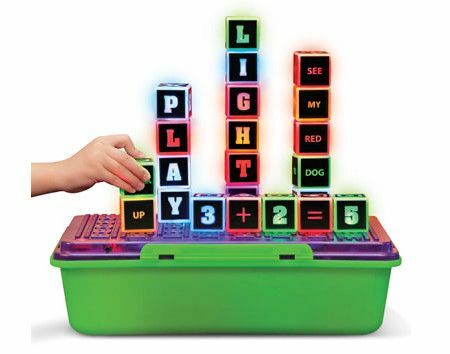 Each purchase of the Illuminated Learning Blocks will comprise of a pegboard as well as three dozen 1″ blocks that will emit a colorful glow or mesmerizing flash whenever it is plugged into the board or another block. There will be a dozen displays of shapes, numbers, and basic mathematical signs; while there will be another that shows off the letters of the alphabet; and the final dozen will come emblazoned with simple words such as “red”, “dog”, and “big”. Toddlers are able to stack up these blocks into towers before “graduating” to counting and reciting their ABCs, whereas older children will have the chance to compose sentences, practice their times tables, or even solve basic equations. Each set can be used to play 39 different games,tic-tac-toe and checkers included, and the board itself functions as a storage container for added functionality. The Illuminated Learning Blocks will be powered by a trio of AA batteries.